Every furniture person is drawn to a certain type of piece. 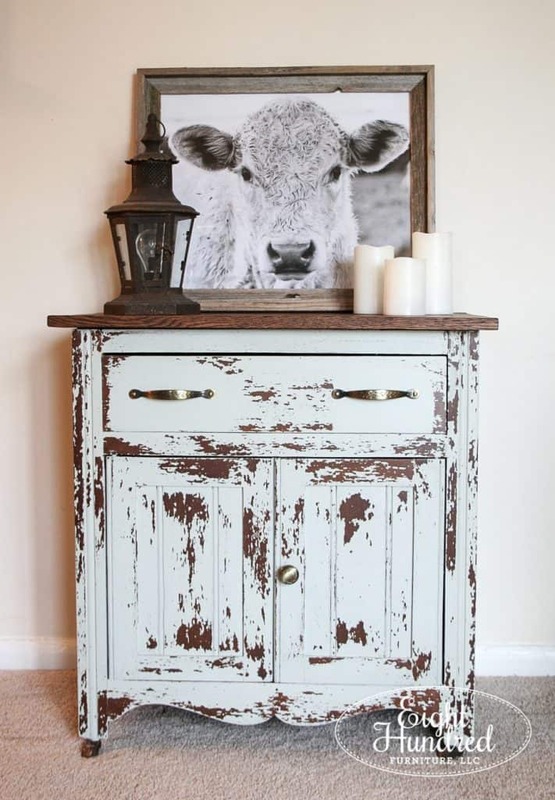 Some people really love buffets while others gravitate towards dressers. I’m a washstand kind of girl. I’m drawn to them and I hone in on them whenever I’m at an antique store, auction or thrift shop. They’re such convenient sizes and they have so many uses in the home! 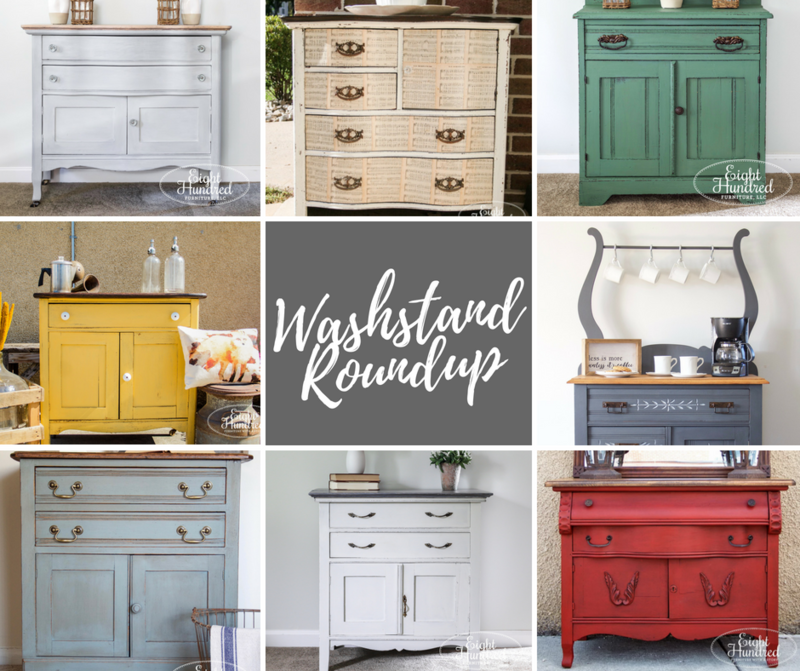 Today, I’m sharing my absolute favorite washstand projects that I’ve completed in the past. While others simply have a backsplash. Those with the towel bars typically had a wash basin and water pitcher that sat on the top and a towel hanging from a towel bar on the back. Those without the towel bars were called commodes and the cabinet on the bottom held chamber pots. Washstands and commodes were important pieces of furniture because they essentially were the bathrooms of the home prior to the onset of indoor plumbing. 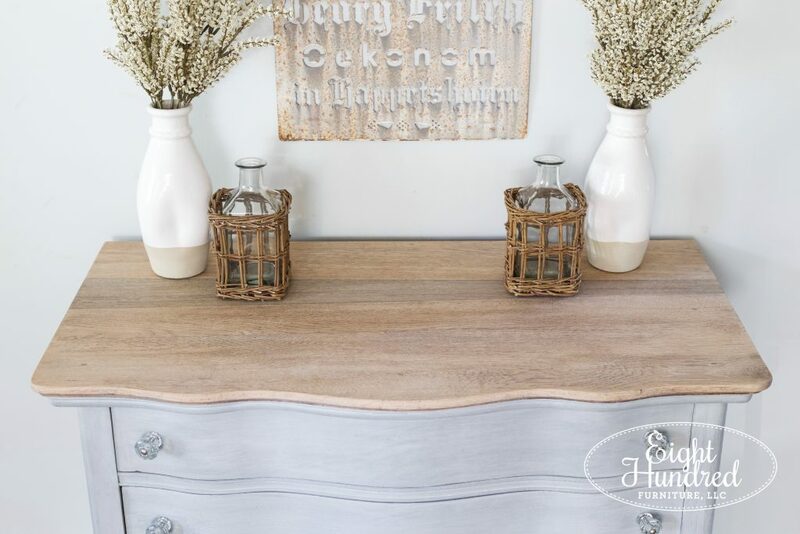 Obviously we don’t need them for that purpose anymore in 2018, so these handy sized pieces make for amazing nightstands, entrance tables, vanities in the powder room, bathroom storage and more! I’ve found all kinds of washstands in different sizes and shapes. 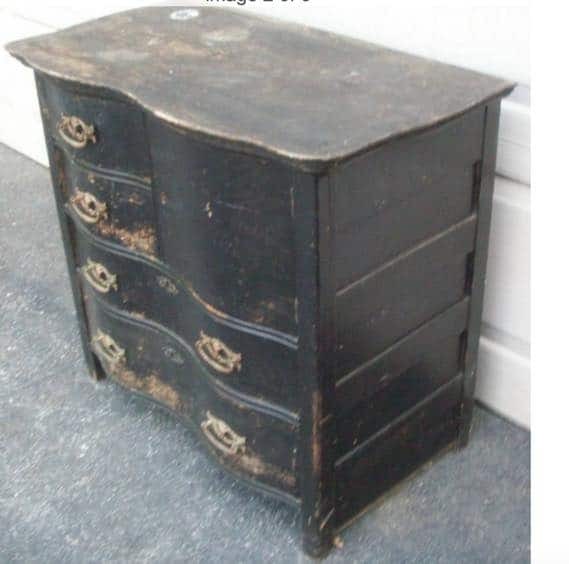 This serpentine front washstand was a bit of a hot mess when I found it. The door on the top right was where the chamber pot would have gone. After stripping the top down and decoupaging some sheet music on the fronts of the drawers and door, this sad little washstand was looking quite handsome. The pitcher on the top was my nod to its original purpose. 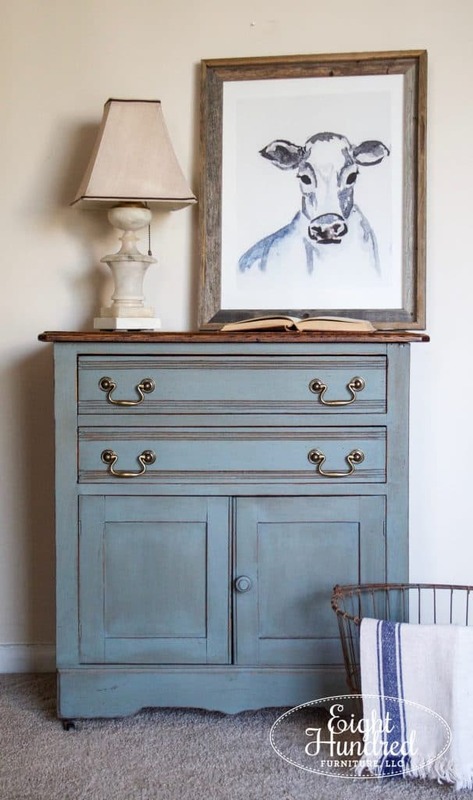 This washstand was one that I painted early on in the start of my professional furniture painting career. It had very straight lines and was made from oak. 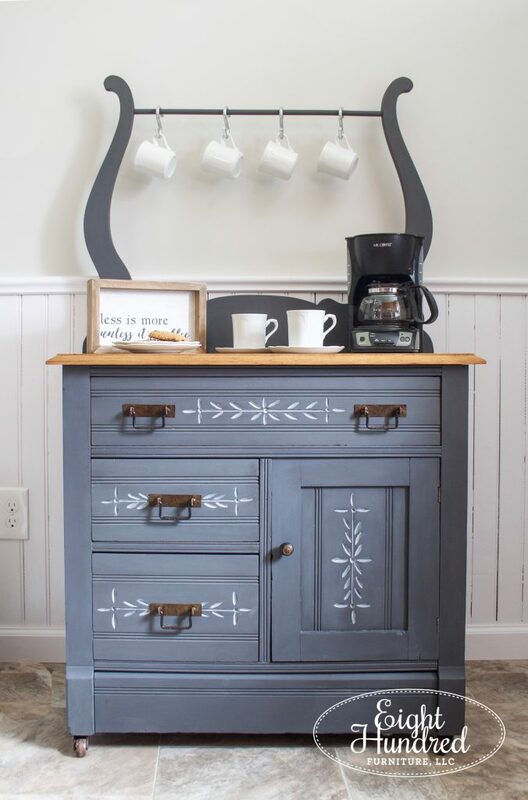 It got a chippy makeover using Mora by Miss Mustard Seed’s Milk Paint. This washstand had a lovely bit of detail along the bottom and a gorgeous lip along the top. 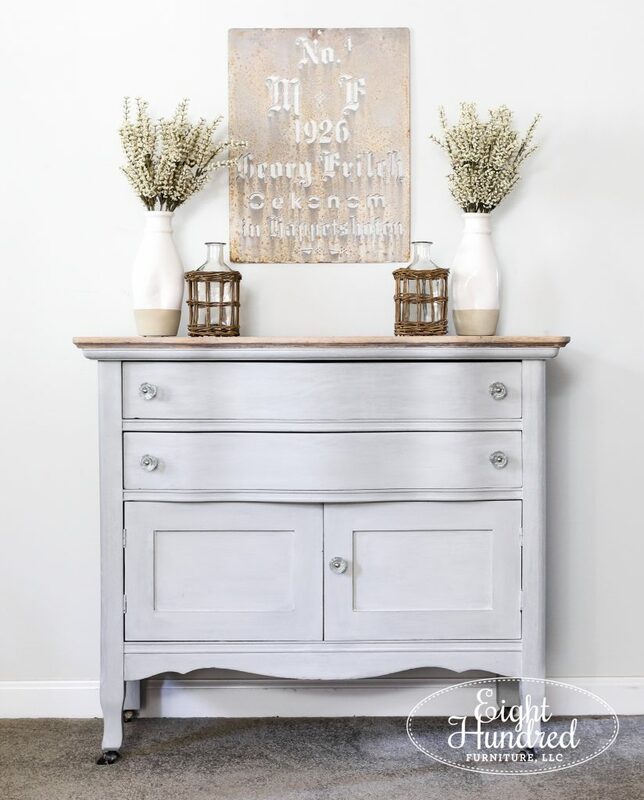 It refinished beautifully with a combination of General Finishes products on top and Miss Mustard Seed’s Milk Paint on the base. Find out how I did it here. This gorgeous piece was one of the larger washstands I’ve completed. It had a very commanding shape, so I thought complimenting it with a bold color was a fitting design choice. 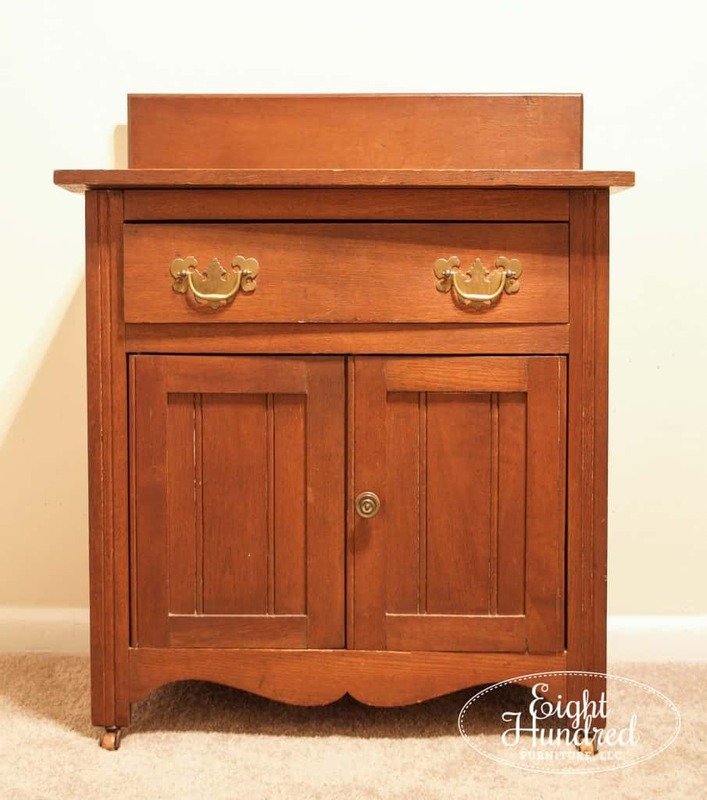 Then I found some that were too pretty to paint, like this Eastlake washstand. Unfortunately, it never sold in its gorgeous all wood state, so I did wind up painting it. 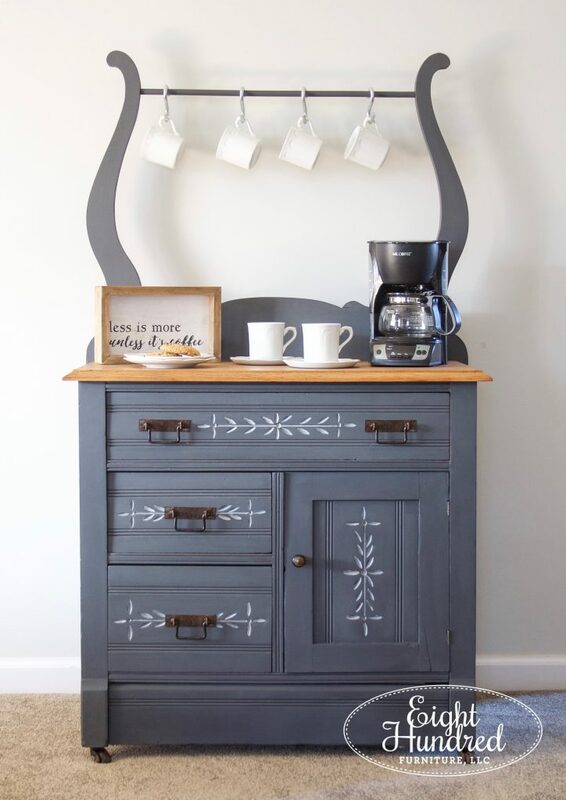 This washstand coffee bar is probably one of my most favorite makeovers of all time. The towel bar on this piece was in such good shape that it seemed a shame to discard it. So a quick Pinterest search revealed that I could repurpose it to hang coffee mugs! I was all about the blues on this pretty washstand. 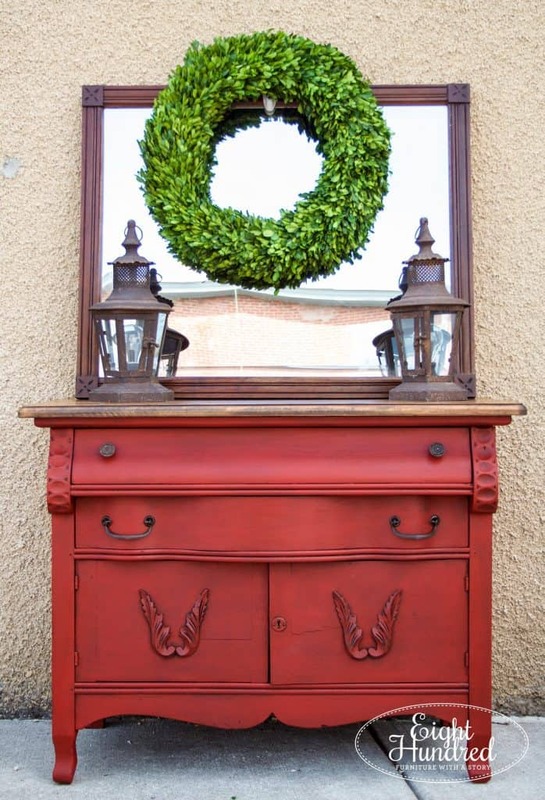 This was one of the first pieces I painted using Miss Mustard Seed’s Bergere and it was then that I discovered how pretty it looked topped with Antiquing Wax. This piece is now in the home of one of my friends! Here is a more recent project. 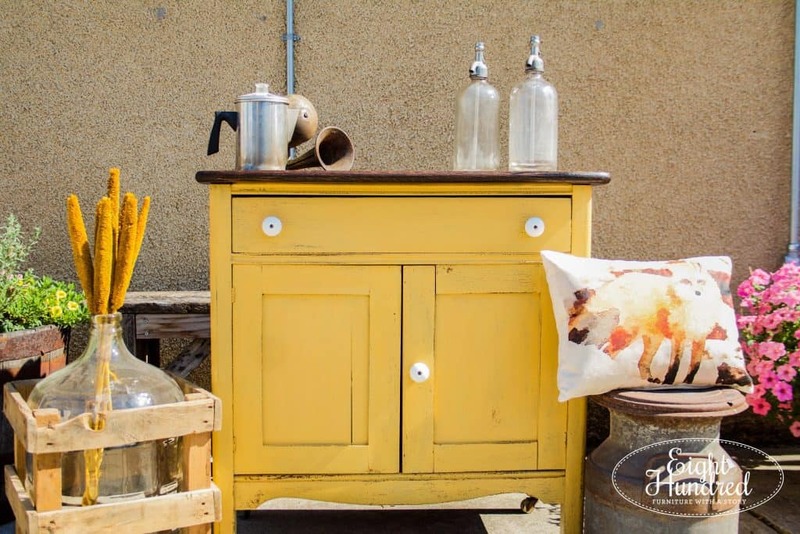 This washstand came a long way from where it started. I learned how to remove strong cat urine odor from furniture on this piece. It came out fresh as a daisy and utterly lovely after a bespoke treatment of Miss Mustard Seed’s Boxwood and Kitchen Scale. 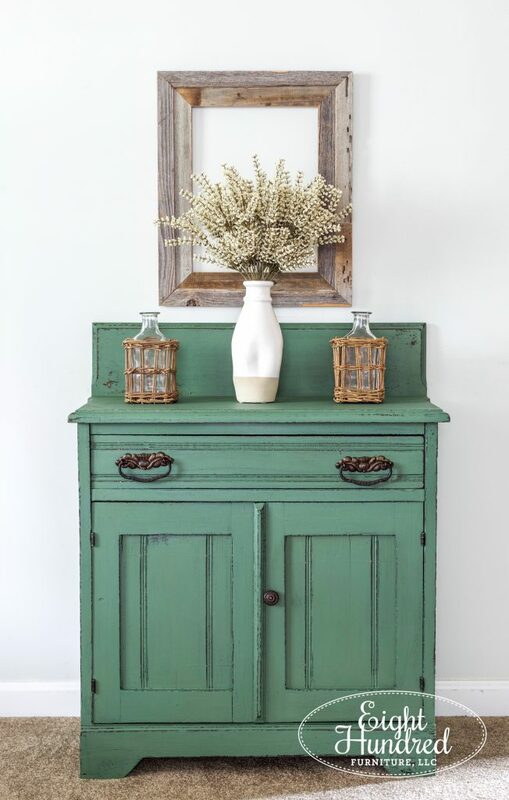 Let’s complete my washstand roundup with this light and airy serpentine fronted beauty. 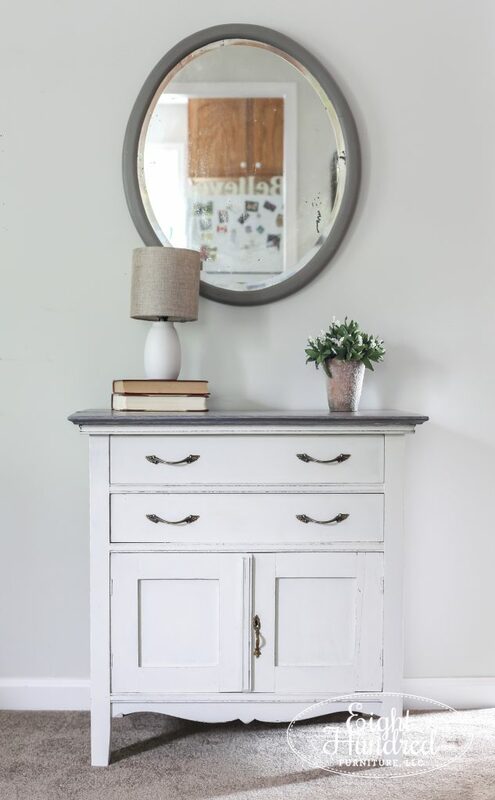 I loved everything about this piece – the light color, the white waxed finish, the light freshly sanded top and the glass knobs. 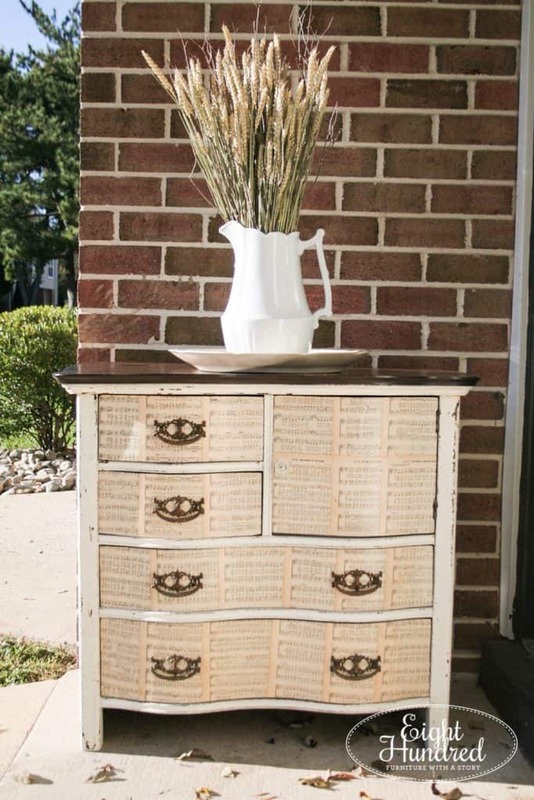 This piece was purchased by a lovely customer at Morgantown Market who will be converting it into a bathroom vanity complete with a vessel sink.